A four-part round braid is very versatile. It's used for everything from bolo ties and belts to horse tack and whips. It's my preferred strap for purses and pouches, being both handsome and strong. It's also the thing I'm asked to teach more often than any other crafting skill I have. So I've made a two-minute video demonstrating the four-part round braid. Once you learn how to make this braid, play around with mixing colors. 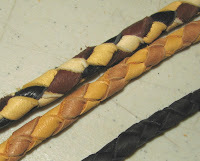 You can get some interesting looking braids depending on the number of colors and their placement. I finish mine off by stitching through the layers of leather with artificial sinew and binding with a double wrap-around. This secures the ends from coming loose and is easy to conceal with a leather wrap. For anyone interested in learning more about leather braiding or fancy knot tying, I recommend the book Leather Braiding by Bruce Grant. It's extremely easy to learn from, with wonderful illustrations by Larry Spinelli. Available through your Public Library or favorite bookstore. 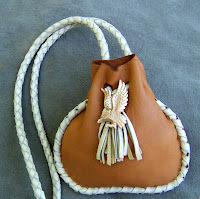 If I weren't a leathercrafter, I believe I would be a potter. Although it doesn't seem so at first glance, they share many common traits. 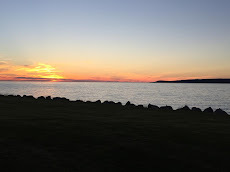 Both involve working with the gifts of the Earth, both are very hands-on (meaning you get it under your fingernails, lol) and involved in both there is more than a bit of bending the medium to your will while respecting its nature. There are many fine pottery shops on Etsy. 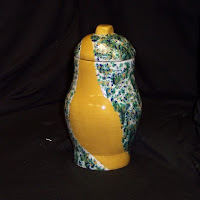 One of my favorites is Beggar's Tomb Pottery. I love the rainbow of color that greets you when you open the pages of Carmela Picone's shop and it delights me to know that color is as important to her as it is to my eyes. 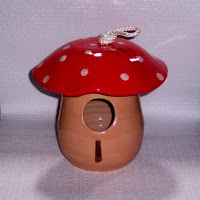 Her creations are both functional and whimsical, like this darling birdhouse that looks like a toadstool an elf might reside in! Anyone who displays wares on the web knows how important photography is and her pictures are outstanding -- the black background really showcases this lovely Seawind Vessel! In Carmela's words, "I'm a retired health professional who has taken my hobby of pottery and turned it into a new career. I live in rural Virgina in a log home surrounded by woods. Much of my garden art is inspired by nature and my own gardens and also from my own imagination and love for fantasy. My previous career was so serious that I take every opportunity to be whimsical and have fun in my art. It is my hope that my work will bring beauty to everyday objects and a smile to those who either see or use my pieces." 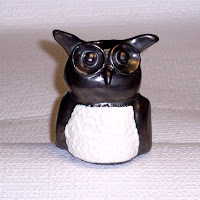 That really comes through when you visit her shop -- I smiled when I first saw this sweet little owl whistle! Her grandmother introduced her to the wheel, and she honors that memory by marking each piece with a tree, her grandmother's mark. I am sure Grandma would be proud of this lovely artwork! Carmela is always glad to take custom orders, so keep that in mind! Thank you, Carmela, for letting me write about your awesome work!